The CROMLAVIEW® CR200 color sensor processes colors in a perceptual way (i.e. according to human perception). The two channels allow for applications that demand high standards of the sensor technology. By using the second color sensor channel this sensor can be used in different modes of operation. In the dual channel mode the sensor can be operated as two single sensors, which work with the same gain and illumination intensity. With the activated stabilization function (CROMLASTAB®) the sensor can be used with an external stabilization target as a single channel sensor. The symmetric design of the sensor facilitates very high drift stability against age and temperatures. In the color difference mode, compliance and synchronism between the two sensing channels are crucial. The balancing method CROMLABALANCE® is available for this purpose. It allows for simple and effective channel balancing over the client’s entire color space. In the dual channel mode the sensor can be operated as two single sensors, which work with the same gain and illumination intensity. 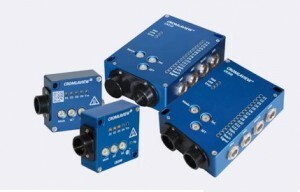 With the activated stabilization function (CROMLASTAB®) the sensor can be used with an external stabilization target as a single channel sensor. The symmetric design of the sensor facilitates very high drift stability against age and temperatures. In the color difference mode, compliance and synchronism between the two sensing channels are crucial. The balancing method CROMLABALANCE® is available for this purpose. It allows for simple and effective channel balancing over the client’s entire color space. When teaching in a “zero-difference” between the two color channels, test objects can be inspected for color identity, even if the absolute color has not been fixed. A zero-difference can also be used for edge detection. Another advantage of the color difference mode is the recognition of transparent objects against changing backgrounds (e.g. transparent labels in the packaging industry). Changing backgrounds can frequently occur in terms of deviations in height or structure of the object. Also in such cases, the color difference mode facilitates the recognition of colored structures, which would otherwise be impossible with an absolute measurement.